Babies born after being exposed to opioids before birth are more likely to be delivered in regions of the U.S. with high rates of long-term unemployment and lower levels of mental health services, according to a study from researchers at Vanderbilt University Medical Center and the RAND Corporation. Studying more than 6.3 million births in a diverse group of eight states, the study found that rural counties plagued by long-term unemployment had significantly higher rates of babies born with neonatal abstinence syndrome as compared to urban counties with lower unemployment rates. Counties with shortages of mental health providers also had higher levels of neonatal abstinence syndrome as compared to other counties. The association was observed primarily in urban areas. The study, published in the Jan. 30 edition of the Journal of the American Medical Association, is the first to examine the association between long-term economic conditions, health care provider shortage areas and the incidence of neonatal abstinence syndrome, which can occur when babies are chronically exposed to opioids before birth. "The finding should open our eyes to the social complexities that lead to newborns being treated for drug withdrawal in our nation's hospitals," said Stephen W. Patrick, MD, MPH, MS, Director of the Vanderbilt Center for Child Health Policy and lead author of the paper. "The opioid crisis is not just a health care problem, it is also a social problem, and solutions will need to address the social needs of communities as well as the health care needs. "As Congress considers legislation, particularly those related to building infrastructure in rural communities, it should consider that these investments may also benefit the health of communities." Patrick and his colleagues have shown previously that one consequence of the nation's opioid epidemic has been a sharp increase in the number of newborns who show signs of withdrawal from opioids. From 2000 to 2014, the rate of neonatal abstinence syndrome rose from 1.2 cases per 1,000 hospital births to 8 cases per 1,000 births. In 2014, the average was one infant born every 15 minutes in the U.S. with neonatal abstinence syndrome. While poor economic conditions have been linked to opioid use, there had been no large-scale studies examining whether those issues also are associated with newborn exposure to the drugs. Researchers from Vanderbilt and RAND analyzed information about 6.3 million births from 2009 through 2015 in the 580 counties in Florida, Kentucky, Massachusetts, Michigan, North Carolina, New York, Tennessee and Washington. Those cases were compared to the 10-year unemployment rate for each of the counties, as well as factors about health care workforce levels. Counties with persistently elevated levels of unemployment had higher rates of neonatal abstinence syndrome. The rate of neonatal abstinence syndrome in the counties with the highest unemployment rate was 20.1 cases per 1,000 births, compared to 7.8 cases per 1,000 births in the counties with the lowest unemployment rates. 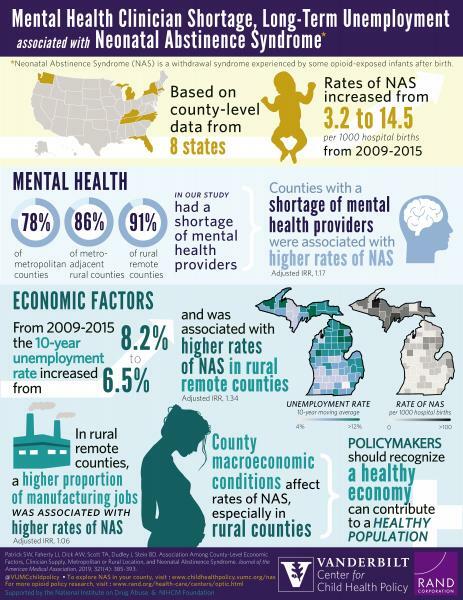 The study also found higher rates of neonatal abstinence syndrome in counties with shortages of mental health workers, primarily in metropolitan counties. Counties with shortages of mental health workers experienced 14 cases of neonatal abstinence syndrome per 1,000 births as compared to rates of 1.6 cases per 1,000 births in other counties. There was no such association with physical health providers. "We know that individuals with mental health problems are more likely to use or be dependent on opioids," said Dr. Bradley D. Stein, MD, PhD, senior author of the study and Director of the RAND Opioid Policy Center. "Our findings suggest that until we can provide better access to effective mental health care, we face an uphill battle effectively addressing the opioid crisis."